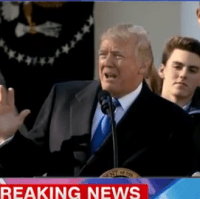 President Donald Trump described the March for Life as a “movement born out of love” during his address to pro-life advocates Friday in Washington, D.C.
Trump is the first sitting president to address the March for Life. He spoke to the crowd live from the Rose Garden, with Vice President Mike Pence and pro-life advocates gathered around him. “That is why we march, that is why we pray, that is why we declare that America’s future will be filled with goodness, peace, joy, dignity and life for every child of God,” he said. Trump praised pro-life advocates for “working with tireless devotion” to provide parents with the support they need to choose life for their unborn babies. He thanked the pregnancy centers and maternity homes across the United States that provide a “family” to pregnant moms and post-abortive women who are desperately seeking help.